Ah, Thanksgiving is right around the corner and then, after that, holiday parties and plenty of good cheer. However, as the year presses on, the temperature is going to start dropping. The winter season can prove difficult for most plant life, and your trees are no different. As the season comes into full swing, you may want to consider the following to make sure your trees weather the frost. 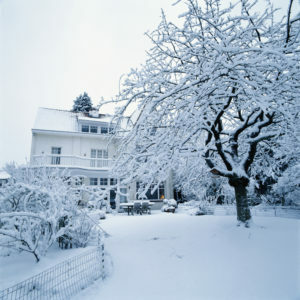 Let’s take a look at some tree care tips for winter. Though you may not use rock salt in your garden, it will certainly make its way to walkways, patios, and sidewalks. Whenever possible, avoid using rock salt to clear the ice around your home. Not only is it bad for the asphalt or concrete you spread it over, it’s also bad for your trees and any other plant life that it touches. Instead, opt for more mild ice melts that use calcium, magnesium chloride, or potassium. Though rabbits and squirrels are certainly cute, the damage that they’ll do to your trees is not. Spend a little time covering up your trees with plastic tree guards so that they’re safe through the winter season. Wrapping your trees in crepe paper tree wrap can also help to protect them against “sunscald”. Sunscald occurs when the sun thaws your tress during the day and then the cold air freezes them again at night. This cycle can cause cracks to form in the bark and other associated issues. If you’re worried about your trees, call in the experts to assess them and then prevent further issue. We’ll take a look at what’s going on and address any problem we see the with the careful expertise that comes with being a specialty arborist service. Whether your trees are suffering from weak branches, disease, cracks, or anything in between, you’ve come to the right place. For the most part, the larger trees will be able to weather the season just fine. It’s the smaller or younger trees that may require your attention. This entry was posted on Tuesday, November 13th, 2018 at 8:47 pm. Both comments and pings are currently closed.